The result of a major gift by Amasa Stone, both Case School of Applied Science (located in downtown Cleveland) and Western Reserve College (located in Hudson, Ohio) moved to adjacent campuses in the University Circle area of Cleveland. 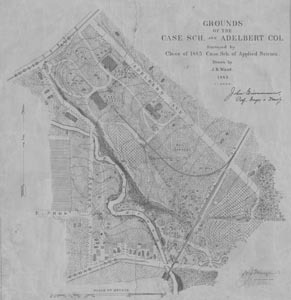 Western Reserve moved to its University Circle location in 1882 and changed its name to Adelbert College of Western Reserve University. The Adelbert campus originally consisted of 4 buildings: the Main Building (for many years known as Adelbert Main, and currently known as Adelbert Hall); the Dormitory (for many years known as Adelbert Hall and finally known as Pierce Hall); the privy; and the president's house (Cutler Hall). Case moved to its University Circle location in 1885. It had one original building on campus, the Main Building (also known as Case Main). Number of buildings in use by Case School of Applied Science in 1886: 1. Number of buildings in use by Adelbert College in 1886: 5. Featured on this map are the original 5 buildings (and the observatory built for Adelbert College circa 1883). The Adelbert Main Building is labeled Adelbert College. (That is also what is inscribed above the main doorway). 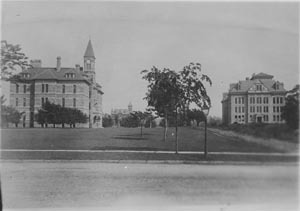 This photograph is one of the earliest campus photographs to feature most of the buildings. We see (from left to right) Adelbert Main, the rooftops of Cutler Hall and Pierce Hall, part of the roofline of the Adelbert Gym (built in 1888) and Case Main.